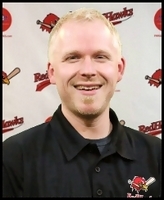 Karl Hoium has been with the RedHawks since 2008 and the Assistant General Manager since November 2017. He originally was the Director of Group Sales, before moving into the role of Director of Promotions in 2014. After graduating with a BS degree in Mass Communications from Minnesota State University Moorhead in 2006, Hoium got his start in the sports industry as an intern with the Alexandria (MN) Beetles of the Northwoods League for their 2006 season. Previous to his start with the RedHawks, he was also the Beetles Assistant GM in 2007. Hoium resides in Moorhead, with his wife, Savannah, and their dog, Rubie.